, the celebrated abbe and reformer of the monastery of La Trappe, was born January 9, 1626, at Paris. 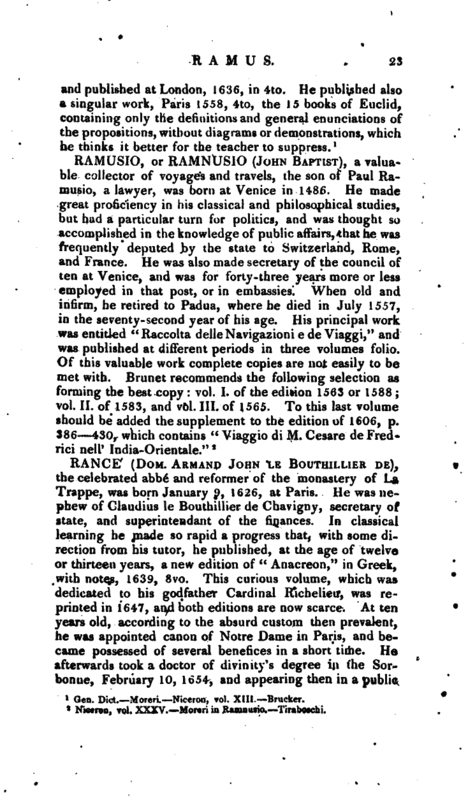 He was nephew of Claudius le Bouthillier de Chavigny, secretary of state, and superintendant of the finances. In classical learning he made so rapid a progress that, with some direction from his tutor, he published, at the age of twelve or thirteen years, a new edition of “Anacreon,” in Greek, with notes, 1639, 8vo. This curious volume, which was dedicated to his godfather Cardinal Richelieu, was reprinted in 1647, and both editions are now scarce. At ten years old, according to the absurd custom then prevalent, he was appointed canon of Notre Dame in Paris, and became possessed of several benefices in a short time. He afterwards took a doctor of divinity’s degree in the Sorbonne, February 10, 1654, and appearing then in a public | character, soon became distinguished not only for taste and politeness, but for those amiable qualifications which are of use in society. He was not however without his frailties, and it is said that he refused the bishopric of Leon from a motive of vanity. He was then appointed almoner to the duke of Orleans, and made a shining figure in the assembly of the clergy in 1655, as deputy from the second order. At length becoming conscious how little splendour and preeminence avail to happiness, he bad adieu to all, and devoted his days to religious exercises. It has been said, that this resolution was the consequence of a visit he paid to a favourite lady, from whom he had been absent for some time, and whom on entering her apartment he found dead in her coffin, and frightfully disfigured with the smallpox. 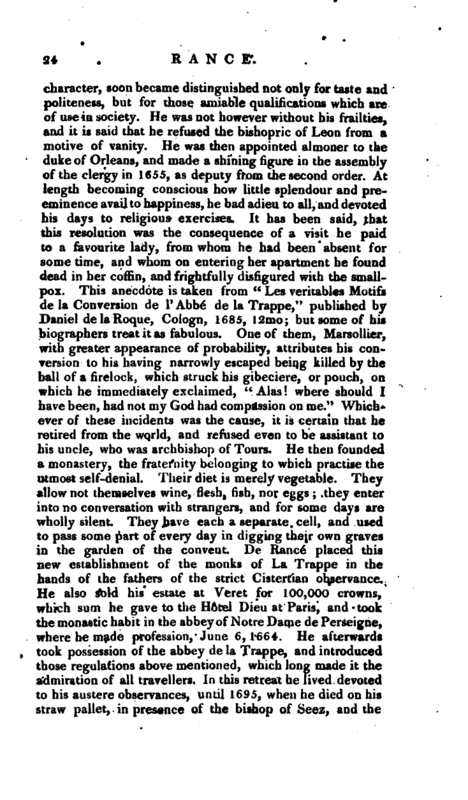 This anecdote is taken from “Les veritables Motifs de la Conversion de l’abbé de la Trappe,” published by Daniel de la Roque, Cologn, 1685, 12mo; but some of his biographers treat it as fabulous. One of them, Marsollier, with greater appearance of probability, attributes his conversion to his having narrowly escaped being killed by the ball of a firelock, which struck his gibeciere, or pouch, on which he immediately exclaimed, “Alas! where should I have been, had not my God had compassion on me.” Whichever of these incidents was the cause, it is certain that he retired from the world, and refused even to be assistant to his uncle, who was archbishop of Tours. He then founded a monastery, the fraternity belonging to which practise the utmost self-denial. Their diet is merely vegetable. They allow not themselves wine, flesh, fish, nor eggs; they enter into no conversation with strangers, and for some days are wholly silent. They have each a separate cell, and used to pass some part of every day in digging their own graves in the garden of the convent. De Ranee placed this new establishment of the monks of La Trappe in the hands of the fathers of the strict Cistertian observance. He also sold his estate at Veret for 100,000 crowns, which sum he gave to the H6tel Dieu at Paris, and took the monastic habit in the abbey of Notre Dame de Perseigne, where he made profession, June 6,1664. He afterwards took possession of the abbey de la Trappe, and introduced those regulations above mentioned, which long made it the admiration of all travellers. In this retreat he lived devoted to his austere observances, until 1695, when he died on his straw pallet, in presence of the bishop of Seez, and the | whole community, October 26, 1700, aged 74, leaving many pious works; among which the principal are, a book “de la Saintété des Devoirs de l’Etat monastique,” 1683, 2 vols. 4to “Eclaircissemens sur ce Livre,” 1685, 4to; “Explication sur la Regie de S. BenoSt,” 12mo; “lieflexions morales sur les quatre Evangiies,” 4 vols. 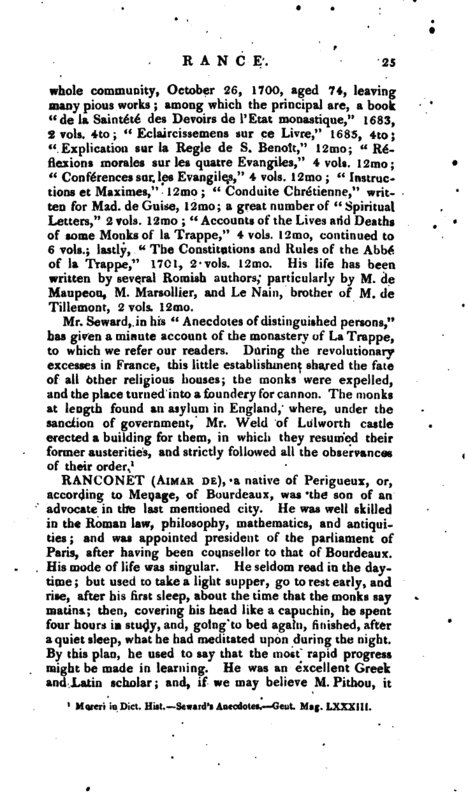 12mo; “Conferences sur les Evangiies,” 4 vols. 12mo “Instructions et Maximes,” 12mo; “Concluite Chretienue,” written for Mad. de Guise, 12mo; a greafnumber of “Spiritual Letters,” 2 vols. 12 mo; “Accounts of the Lives and Deaths of some Monks of la Trappe,” 4 vols. 12tno, continued to 6 vols. ; lastly, “The Constitutions and Rules of the Abbe of la Trappe,” 1701, 2 vols. 12mo. His life has been written by several Romish authors, particularly by M. de Maupeou, M, Marsollier, and Le Nain, brother of M. de Tillemont, 2 vols. 12mo. Moreri in —Dict. Hist. Reward’s Anecdotes. —Gent. Mag. LXXXIII.